Telecom stocks can be rewarding, but picking the right one can be tougher than you think. Telecom sector and wireless-service provider stocks are down, on average, this year. That may not last, though, as the industry is undergoing change and the next wave of growth for wireless markets may be right around the corner. If you're looking for a telecom play, the big telephone companies are a good place to start. Wireless and voice networks are utility-like in nature and are often viewed as a basic commodity. That means their revenues tend to be relatively stable and predictable, and in the case of the nation's largest wireless providers, Verizon (NYSE:VZ) and AT&T (NYSE:T), they also pay attractive dividends. "P/E" = price-to-earnings ratio. Data source: Yahoo! Finance. Investing in these companies gets really exciting, though, when you consider the future wireless networks they are developing, dubbed "5G." The new 5G network is more than just faster speeds; it is expected to be the host for billions of devices that will be connected to the internet over the next few years. New technologies like autonomous vehicles and remote healthcare could also benefit. Verizon and AT&T are leading the way, with initial rollout of the next-gen service expected later this year. In addition to traditional wireless, other companies offer alternative-style networks that cater to business and government organizations. Globalstar and Iridium both have satellite-based networks, and Cogent, Vonage, and IDT specialize in internet-based voice communications. Cable companies similarly have their hands in the communications industry. These companies are diversified, often offering internet and TV service as well as a wide array of different voice services. Some of them, like Comcast (NASDAQ:CMCSA) and Time Warner (NYSE:TWX.DL), are also media companies with TV entertainment and movie production businesses built in. Comcast also struck a deal with Charter Communications (NASDAQ:CHTR) earlier this year, as both companies are rolling out new mobile-phone services. That diversification among communications companies is increasing, too. Cable company CenturyLink (NYSE:CTL) has a full suite of cable TV, internet, and phone services, and it is finalizing a deal to purchase internet and fiber service company Level 3 Communications (NYSE:LVLT). However, the landline voice-service business model is getting dated, and providers like Frontier Communications (NASDAQ:FTR) are struggling. That dividend yield looks too good to be true, and it probably is: A high yield means Wall Street has punished share prices, and a steep dividend cut can oftentimes follow. For an alternative play, see the technology service providers that are helping build the infrastructure for future networks like 5G. InterDigital (NASDAQ:IDCC) designs, patents, and licenses out the technology to communications companies. ORBCOMM (NASDAQ:ORBC) provides machine-to-machine communications, a service that falls under the "Internet of Things" umbrella. Sonus Networks (NASDAQ:RBBN) makes the hardware that secures internet-based calls, but it is also getting into wireless network hardware. The big name here is Nokia (NYSE:NOK), which has reimagined itself as a developer and builder of future network infrastructure. The company also pays a dividend that is currently at 3%. 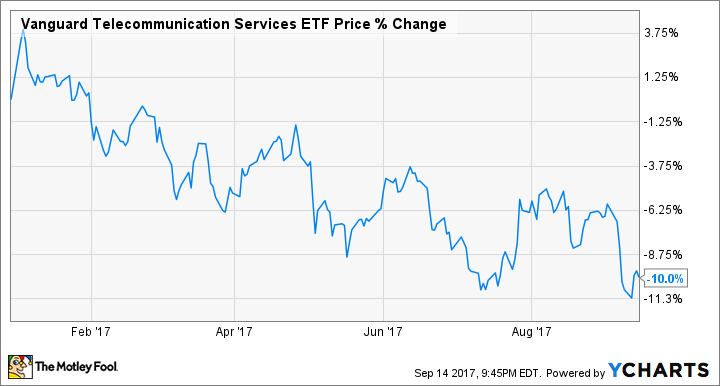 If you prefer to go the route of exchange-traded funds, take a look at the Vanguard Telecommunications Services ETF (NYSEMKT:VOX). The fund is diversified across 27 companies, including many of those mentioned above, and has a projected dividend yield of 3.6%. Owning individual stocks can be rewarding, though. My personal favorites are those companies building out the next generation of communications networks and blurring the lines between the internet and traditional telephone service; I own Verizon and Iridium Communications. If you need some more help whittling down the field, take a look at our checklist on investing in telecom stocks.